The Audi RSQ is a 2-door, 2-seat, mid-engine sports coupe with all-wheel drive and a 6-speed automatic transmission. As one might expect from a future car, this concept vehicle is powerful as well. The Audi RSQ has a 5.0 liter, 610 hp twin-turbo V-10 engine with 553 ft.-lb of torque. Estimated acceleration from 0 – 60 is 4.0 seconds. For the first time ever, Audi developed a car specifically for a major Hollywood motion picture. Audi engineers created a car for ‘I, ROBOT’s’ incredible world of 2035.The resulting Audi RSQ sport coupe is a visionary interpretation of Audi’s typical design language. The most important thing was that despite its extreme character the car should still be recognized as an Audi. The cinemagoer will therefore see the new Audi front-end with the typical single-frame grille in the movie. The RSQ includes special features suggested by movie director Alex Proyas. The mid-engined sports car operated by the story’s police department, races through the Chicago of the future not on wheels but on spheres. Its two doors are rear-hinged to the C-posts of the body and open according to the butterfly principle. In addition to the RSQ concept car, Audi supplied further series-production cars which appear – in disguised shapes – in the movies traffic scenes. Audi also supplied the interior mock-up used for interior car scenes. Designers, engineers, technicians and model engineers had just ten weeks to build the concept car. At the beginning of July the Audi RSQ arrived on the set in Vancouver where it was to stay for several months of shooting. Audi also supplied an outer-skin model of the car to be used in a crash scene, as well as a separate interior mock-up to shoot interior scenes. It is a sculpture that appears very flat, broad and bullish on the road. The laminate glass fiber body of the RSQ is coated with lunar silver paint, which creates the so-called flop effect. That is to say: when exposed to intensive light the bluish sheen of the silver paint takes on a golden tone. The striking shape of the angular body cutouts for the head-light modules influence the front-end appearance of the RSQ. They are combined with side air inlets. The xenon light tubes behind the clear-glass covers enhance the character of the front-end design. Where you find the rear window on most sports coupes, an aluminium hood covers the engine in the RSQ. In plain view this cover is an oval, running right up to the windscreen and integrated into the body by a transverse bar. The gull-wing doors are another RSQ highlight: whenever Will Smith gets into or out of the car, the rear-hinged doors open upwards like a butterfly’s wings, and twist slightly at the same time. The interior of the RSQ was reduced to the essential elements of driving. Will Smith sits in the car as if in a jet aircraft’s cockpit. The center console surrounds the pilot’s body in the bucket seat. The steering wheel is another element in this aircraft cockpit analogy. Like an elevator control, it is open at the top and folds out of the instrument panel after the driver has entered the car. The cockpit atmosphere of the interior is emphasized by the wide panoramic windscreen that extends back into the roof. The glass surface runs from the right and left roof pillars as far as the rear of the cabin. This ensures a much greater field of view for the driver and passenger. All relevant information for driving the car is fed into the digital display in the instrument cluster by means of Audis Multi Media Interface (MMI) control system. The air conditioning and radio of the RSQ are classified as secondary functions. Entertainment functions have been omitted in favor of the sporting concept. The materials used and the colors of the RSQ interior are part of a function-oriented spatial atmosphere. The color spectrum is exclusively in the darker, more technical appearance area with isolated silvery accents. RSQ lettering illuminated with red light is integrated into the door sills. 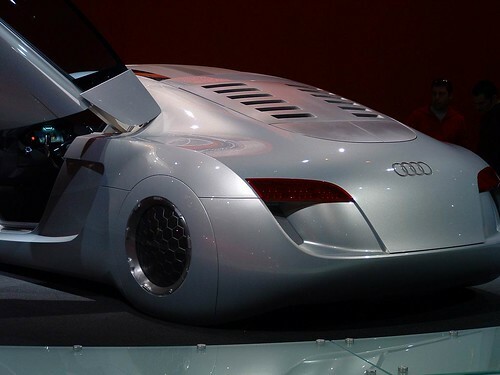 (from Audi Press Release) The futuristic film car Audi RSQ was presented to the public for the first time on April 7, 2004 at the New York International Automobile Show. Audi tackles its most ambitious product placement project ever: For the epic event motion picture „I, ROBOT“, Audi Design developed the spectacular vehicle, which helps leading actor Will Smith – a homicide detective in the year 2035 – solve a mystery that could have grave consequences for the human race. Fox releases "I, ROBOT“ in the U.S. on July 16; the film arrives in Germany in August. by Alex Proyas (Dark City, The Crow) and is set in a world created by famed science fiction writer Isaac Asimov in his short story collection “I, ROBOT“. For the first time ever, Audi developed a car specifically for a major Hollywood motion picture. Audi engineers created a car for „I, ROBOT’s” incredible world of 2035. In addition to the RSQ concept car, Audi supplied further volume-production cars which appear – in disguised shapes – in the movie’s traffic scenes. Audi also supplied the interior mock-up used for interior car scenes. With this project Audi opens up a new chapter in product placement. Previously, the brand with the four rings has always supplied volume-production cars to movie productions. In individual cases, such as “Mission: Impossible II,” these cars were even used in movies before their market launch. With „I, ROBOT“ and the systematic development of a “car of the future,” Audi goes far beyond its previous product placement activities. Audi has been participating as an automobile partner in major movie productions for several years. In addition to John Frankenheimer’s action classic “Ronin” with Jean Reno and Robert de Niro (1998), the brand with the four rings played the automobile lead in "The Insider" (1999) featuring Academy Award Winner Russell Crowe, “Mission Impossible II” (starring Tom Cruise, 2000), “The Mothman Prophecies” (starring Richard Gere, 2002), “About a Boy” (starring Hugh Grant, 2002) and Reese Witherspoon’s “Legally Blond 2“ (2003). The convergence mix is bringing some unlikely partners together as vertical market borders are blurring and morphing not just product categories but entertainment genres. The recent movie "I, ROBOT" has all the makings of a film of epic status – a script inspired by the classic Isaac Asimov short story collection and the public’s first detailed introduction to the capabilities of personal robotics. Everything had to be entirely believable for a film set 30 years from now so when the script called for a futuristic vehicle, a loose tender was put to the world’s leading automotive design studios and Audi won the job. I, ROBOT uses state-of-the-art visual effects to bring the coming world of robots to life. The NS-5 robot, which promises to be as much the star of the movie as flesh-and-blood star Will Smith, is the world’s most advanced consumer robot in the year 2035 at a time when robots have become ubiquitous. To be credible and congruent, every aspect of the movie had to rival the NS-5 in granular detail – the NS-5 features fictitious proprietary technologies such as 3 Laws Safe, Centralcore 247 and a positronic brain. The development of a production car is obviously the job of a designer. Being able to work conceptually with next generation technologies is the dream of all automobile designers. Having a chance to integrate almost free-form creative potential into the development and construction of a futuristic sports coupe, to be driven in an epic futuristic movie is perhaps the grandest stage possible to display technological prowess and futuristic brand relevance. Consequently there was great enthusiasm when Audi Design was awarded the contract to realize the Audi RSQ for the motion picture "I, ROBOT"
"The main aim was to create a car that plausibly fitted into the futuristic scenery of the film, but still represented an unmistakable, visionary statement from Audi", says Julian Hönig, the man responsible for the RSQ’s exterior design. Film director Alex Proyas was attracted by the Audi Nuvolari quattro study in 2003. He liked the design language of the brand with the four rings so much that he decided to contact Audi. It began in early April 2003 when AUDI’s Tim Miksche and Martin Ertl, flew to Vancouver, Canada, where preparations for shooting were underway. "The director, producers, the set designer, the chief camera man and Twentieth Century Fox representatives showed us round to see the entire movie world of "I, ROBOT" – everything from giant stage settings to a humble wrist watch," Miksche recalls. This was the world for which they would produce a car. 24 hours later they had reached agreement: Audi had won the contract ahead of rival automobile manufacturers by presenting the most convincing overall vehicle concept. The agreement called for a ten week project. "When we took off from Munich airport everything was open. But when we landed there again a day later, we had in our briefcases the biggest product placement project in Audi’s corporate history – and a lot of work on our plate," Miksche remembers. Two days later the first quarter-scale model of the RSQ was completed and a set designer from "I, ROBOT" worked with Audi Design in Ingolstadt over the next week finalizing most design and vehicle specifications. 15 Audi designers, engineers and technicians manifested the RSQ on time, delivering it to the film set at the beginning of July. Simultaneously, several other RSQ partial versions were created to enable crash and car interior scenes – an outer-skin of the car to be used in a crash scene, and interior mock-up to enable the shooting of scenes inside the RSQ. The RSQ is a flat, broad and bullish two-seat, mid-engined sports car with sphere-shaped wheels running in similarly shaped wheel arches. The sculpted laminate glass fiber body of the RSQ is coated with lunar silver paint, which when exposed to intensive light the bluish sheen of the silver paint takes on a golden tone. "In this project we enjoyed the greatest possible freedom with regard to technical feasibility, ergonomics and customer requirements – factors that otherwise have high priority. First of all we had to familiarize ourselves with the special vehicle specifications called for by the story and the movie’s environment. The striking shape of the angular body cutouts for the head-light modules influence the front-end appearance of the RSQ. They are combined with side air inlets. The xenon light tubes behind the clear-glass covers enhance the character of the front-end design. Where you find the rear window on most sports coupes, an aluminium hood covers the engine in the RSQ. In plan view this cover is an oval, running right up to the windscreen and integrated into the body by a transverse bar. The interior of the RSQ was reduced to the essential elements of driving. Will Smith sits in the car as if in a jet aircraft’s cockpit. The center console surrounds the "pilot’s" body in the bucket seat. The cockpit atmosphere of the interior is emphasized by the wide panoramic windscreen that extends back into the roof. The glass surface runs from the right and left roof pillars as far as the rear of the cabin. This ensures a much greater field of view for the driver and passenger. All relevant information for driving the car is fed into the digital display in the instrument cluster by means of Audi’s Multi Media Interface (MMI) control system. The air conditioning and radio of the RSQ are classified as secondary functions. The materials used and the colors of the RSQ interior are part of a function-oriented spatial atmosphere. The color spectrum is exclusively in the darker, more ‘technical’ appearance area with isolated silvery accents. RSQ lettering illuminated with red light is integrated into the door sills. Despite its futuristic appearance the RSQ still had to be clearly recognizable as an Audi. Walter de´Silva, Head of Design for the Audi brand group, told his creative team: "You have the freedom to use the craziest ideas, but don’t forget the features that identify the Audi brand.
" The nose end of the film car was therefore designed to yield a typical Audi family resemblance. The trapezoidal shape of the Audi single-frame grille was adjusted to suit the proportions of the sports coupe. "I believe that the Audi RSQ is a possible vision for the future, embedded in a fictional world. It is the consistent further development of brand values such as sportiness, progressiveness and sophisticated design, transferred to the film world of ‘I, ROBOT’." De´Silva concludes: "An Audi of the future could therefore look much the same.